Since 1872, there have been only two vessels named Mount Washington to have cruised the beautiful waters of Lake Winnipesaukee. The first vessel was the S.S Mount Washington, a wooden side-wheeler 178 feet in length with a beam of 49 feet. Referred to today as the "Old Mount", the vessel was built and launched in 1872 by the Boston & Maine Railroad company to transport travelers and cargo from one side of the lake to the other. 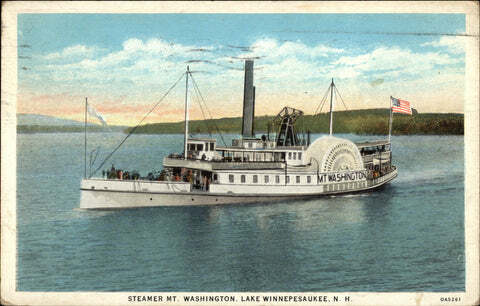 The S.S. Mount Washington was only one of many steamships operating on the lake in the late 1800s. However because she was the fastest vessel and was affiliated with the railroad, she quickly dominated the lake transportation business. By the end of the 19th century the S.S. Mount Washington was boarding more than 60,000 passengers each year. In the early 20th century, the automobile age began to slowly erode the railroad business. Eventually, the S.S. Mount Washington was sold and began her life as a tourist attraction. Her new owner was Leander Lavallee, who was also her Captain. The Grand 'ol Lady continued to carry 60,000 passengers per season and stopped at many ports around the lake. The B&M Railroad continued as well, bringing tourists from the Boston area to her home port of Weirs Beach. By 1920, Weirs Beach had grown to be quite a vacation spot. With a busy railroad station, large dance pavilion and beautiful grand hotel overlooking Weirs Bay, visitors came from far and wide to enjoy the lake. Unfortunately, bad luck struck Weirs Beach in the form of two major fires. The first one in 1924 destroyed the grand Hotel Weirs, and the second marked the end of the Old Mount. On a cold December evening in 1939, a fire broke out in the railroad station and quickly spread down the ramp to the dock where the S.S. Mount Washington was berthed for the winter. Attempts were made to set her free, but lake water levels were low and she was stuck helplessly in the mud. The ship was completely destroyed, as was the entire railroad station and boardwalk. Captain Lavallee was devastated by the loss of the S.S Mount Washington. He'd recently agreed to sell the vessel and was looking forward to enjoying his retirement years. Therefore, many were surprised when Captain Lavallee announced that he would replace the vessel with a new, bigger and faster ship. He rallied local support and formed a new corporation, and set about launching his new venture. While starting the business may have been easy, finding a ship would prove difficult. Large quantities of steel were secured for pre-war munitions, so building a ship was not possible. So, Captain Lavallee searched throughout New England for a vessel that could be purchased and moved to Winnipesaukee. Eventually, a vessel was found on Lake Champlain in Vermont. Built in 1888, the Chateaguay was 203 feet long and constructed of iron. A victim to newer modes of transportation, her owners were looking to sell. The parties agreed on a purchase price of $20,000, and in April of 1940, less than four months after the fire, Captain Lavallee has his ship. However, the real work had yet to come. In the following months, a hired crew from Boston General Ship & Engine Works dismantled the Chateaguay hull, cut it into twenty sections and shipped it by flatbed railroad car from Shelburne, Vermont to Lakeport, New Hampshire. They then carefully reassembled the pieces, constructed a new steel super structure and outfitted the ship with two 750 hp, steam engines, boilers included. The S.S. Mount Washington II was launched August 15, 1940 with a length of 205 feet, a beam of 32 feet and a draft of 7 feet. The final bill for launching he new ship exceeded $125,000, and as a result the new ship needed to navigate some rough financial waters. To clear the debt to Boston General Ship & Engine Works and its owner, Carl Hedblom, ownership of the S.S. Mount Washington II was passed to the Hedblom family in 1941. The family owned and operated the company for the next thirty years, and it was during this time that the company grew in size with the addition of two smaller vessels, the M/V Sophie C. and M/V Doris E.
The S.S. Mount Washington II has undergone many physical changes over the years. The two most significant were the ones that included changes to her designation. In 1946, a replacement of her steam engines with diesel rechristened her as "M/V Mount Washington". In 1982, the ship was cut down the center and an extra 25 feet was added to her length. In doing so, she was reclassified as official ship by maritime standards. Again she was rechristened, this time as "M/S Mount Washington". The future looks bright for Mount Washington Cruises. Times have changed and so has the "Mount". What used to be basically a summer attraction now operates May through October, offering Daytime Scenic, Evening Dinner/Dance and Special Theme cruises. In 1987 a new home port facility was built at Weirs Beach. This new building included an on-shore kitchen, expanded gift shop and modern offices. For the past ten years the "Mount" has been owned and operated by local individuals. With a capacity of 1250 passengers, the Mount is a popular venue for school proms, college gatherings, and large corporate celebrations, not to mention all the tourists visiting New Hampshire. The Mount is a true fixture in the Lakes Region making the choice of where to get married an easy one. We estimate that over 700 happy couples have tied the knot on the Mount and many return to share the memories.